Saturday- We had a quiet day at home again. Dr. Bob and Jackie came over and we played Caton with them. We had played a similar game a few years ago. Bob and I went to lunch at The Mac again. Bob had the #7 and I had #10, the same as yesterday. We left and went to Walmart for his prescription. We returned and took a nice nap. We ate dinner with Dr. Bob and Jackie on the picnic table. They had a really good Chicken Tarragon pie in their freezer which Jackie cooked and we supplied the veggie. After we cleaned up, it started to rain. They came over again and we played Pegs and Jokers until around 9, then we all went to bed. Sunday- We said good-bye to Dr. Bob and Jackie, and of course Trinity, their dog, who left to return home to Georgia. We had another quiet day, we worked around the MH, took a nap, did out usual budgeting, and watched some movies on Prime. Monday- We left around 9 to go to Tomah. We stopped at Walmart, then continued on to the small town of Warrens. 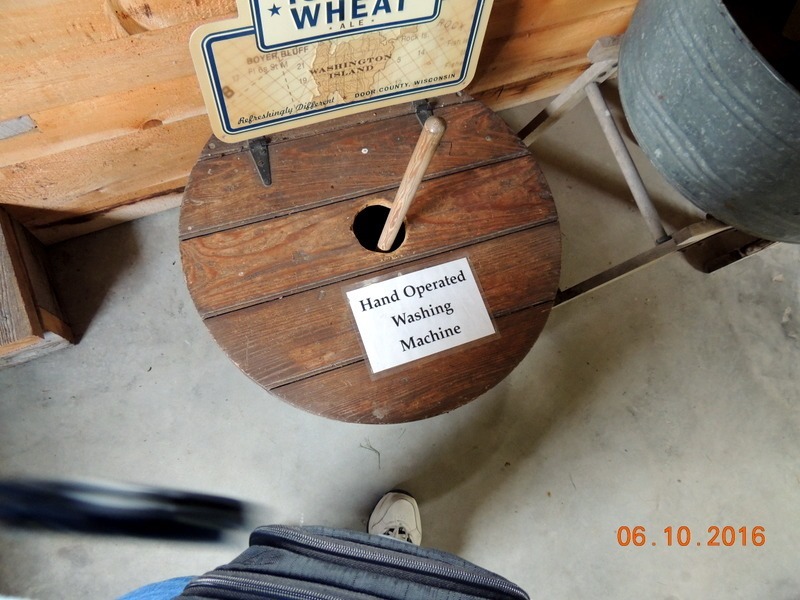 We visited the Wisconsin Cranberry Discovery Center.. 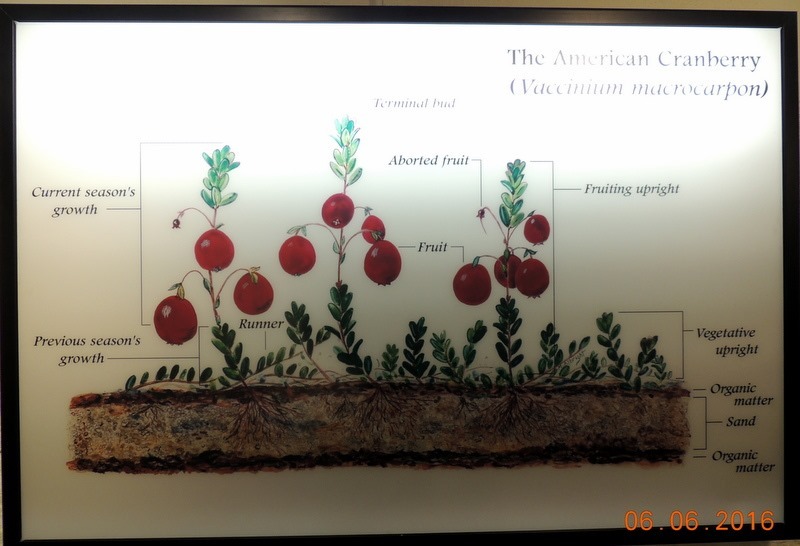 I did not realize that cranberries are the largest fruit crop on Wisconsin. There is a long history of cranberry harvesting in the state, starting with the Native Americans. The first sale of cranberries was from the Native Americans to a settler in 1824. The Discovery Center was originally started in 1889. The current version was opened in 2001. 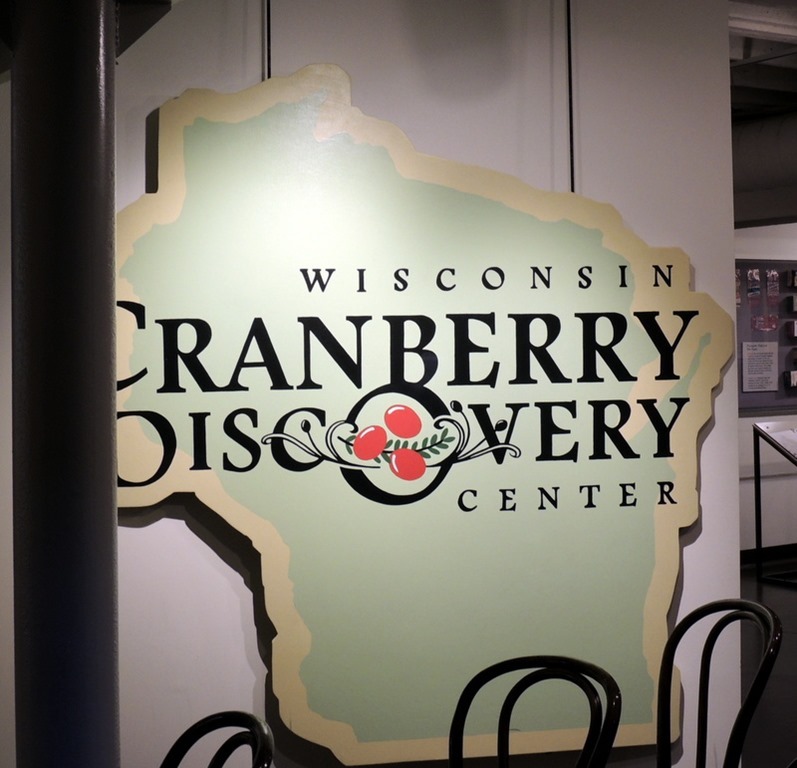 The cranberries were first cultivated in 1853 and today, Wisconsin is the leading producer of cranberries, producing 2/3 of the nations 500 million lbs. of the fruit. Most are grown in the northern and central areas of the state. Above is about the plant. The plant has two growths. This years berries and next years plant. Cranberries were named by European settlers who thought that the blossom resembled a crane’s head and neck. They called the fruit “craneberry’, which ended up being shortened to cranberry. Hand raking was labor intensive. 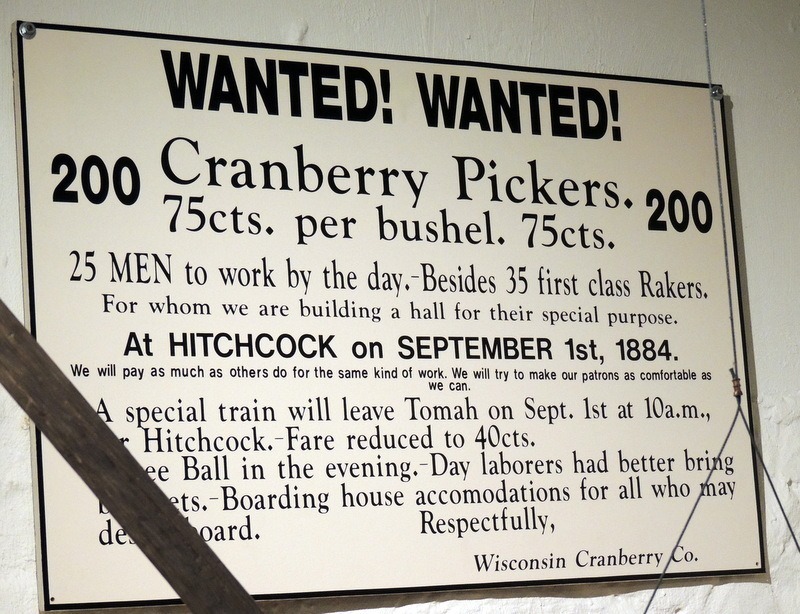 It would take 8 to 10 men working all day to harvest 1 acre of cranberries. In 1924 two men set the record of raking 600 bushels in 10 hours. We enjoyed the visit and would return. We purchased some cranberry salsa. They had some very interesting wines and an ale, which we could have tried, but decided not to. I have two bottles of wine in the MH and we are going to Canada in a week, so we have to be careful about how much alcohol we have in the MH. 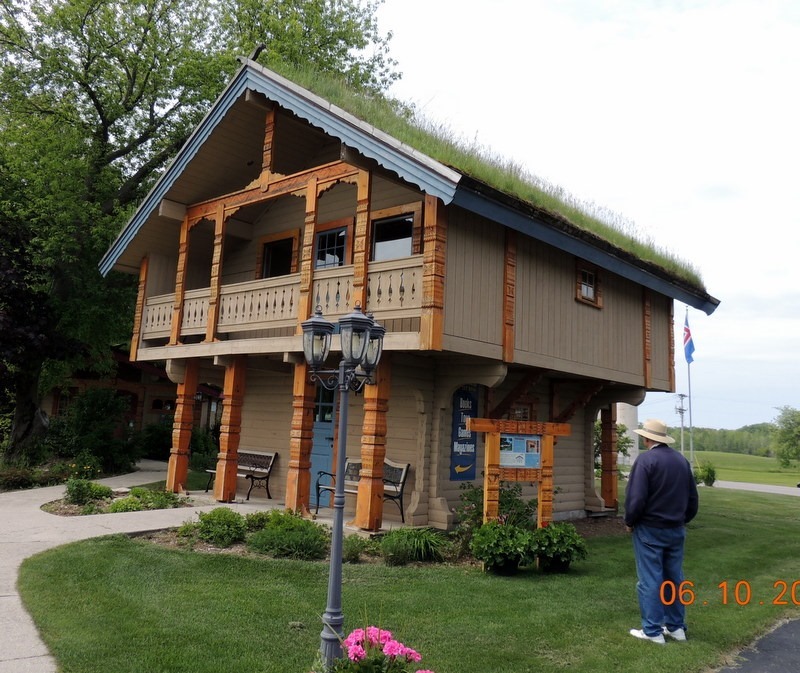 We returned to Tomah and went to the Visitor Center. The gal there was very helpful. She gave us a map of the Eastern Monroe County Amish driving tour. One famous person came from Tomah. Frank King, the creator of the cartoon strip, Gasoline Alley. He was born in Caston, but the family moved when he was four weeks old to Tomah. As a child he drew pictures for his class mates and won prizes at the county fair. Gasoline Alley was first published on Valentines Day, 1921 in the Chicago Tribune. After lunch at Burnstad’s European Restaurant. We started our Amish drive. 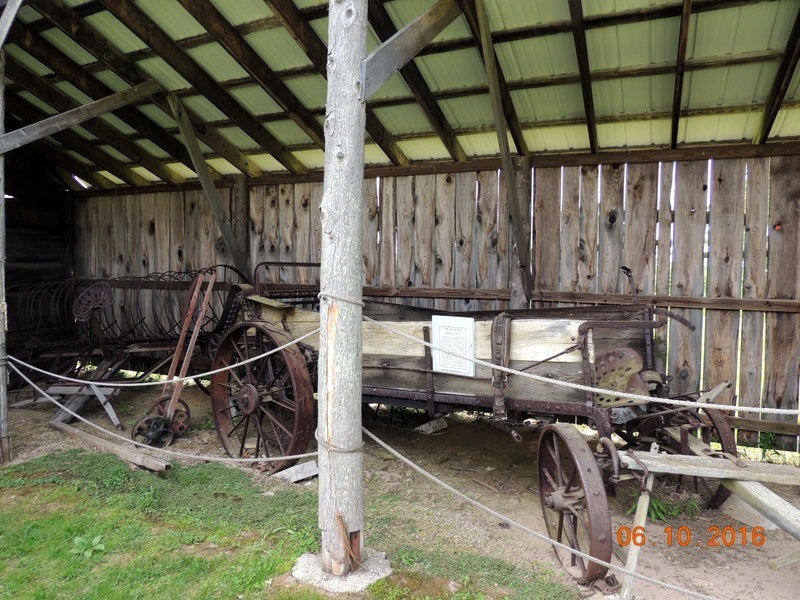 The first Amish moved to Wisconsin in 1966. They chose the area because of the rich and fertile farmland, low real estate prices and the lay of the land. There are currently over 200 families in the area. The average family has 10 to 14 children and are divided into several church districts. We noticed that ALL of the Amish that we encountered waved to us! They are not as friendly in other Amish communities that we have visited. When we were driving, we turned a corner and saw something in the road. It took us a couple of seconds to realize that it was a wagon. On the wagon, riding downhill, was an Amish boy, about 10 years old. He was laying flat on his stomach, with his arms out. We think he was pretending he was flying! It was really cute. He waved and we waved back, chuckling at the kid. The Amish tour took us to the top of a hill and the view was very pretty. We continued on to “Down a Country Road” an Amish shop. It is owned by a non-Amish family. two miles east of the town of Caston on Hwy 33. There are four gift shops and an ice cream shop. 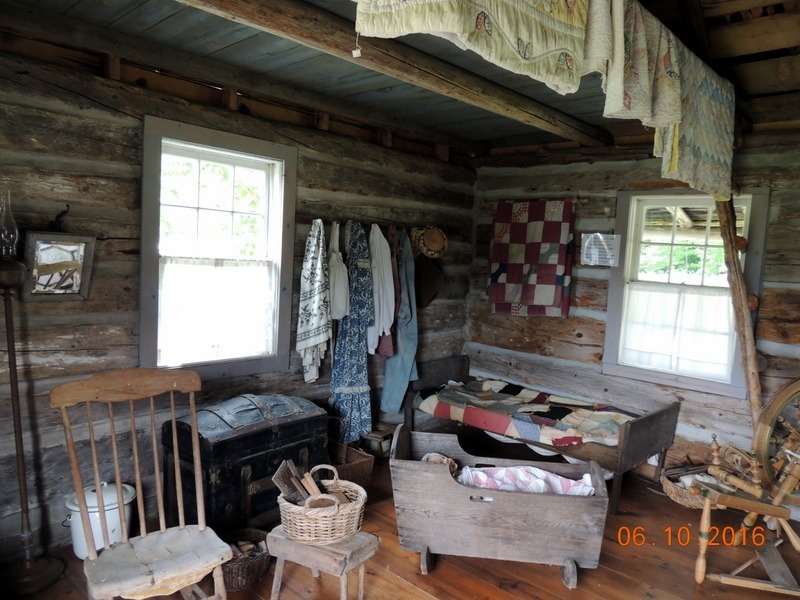 The buildings were built by the Amish and stocked with Amish products. There as even ‘out house’, which really wasn’t, It was cute and had a flush toilet. 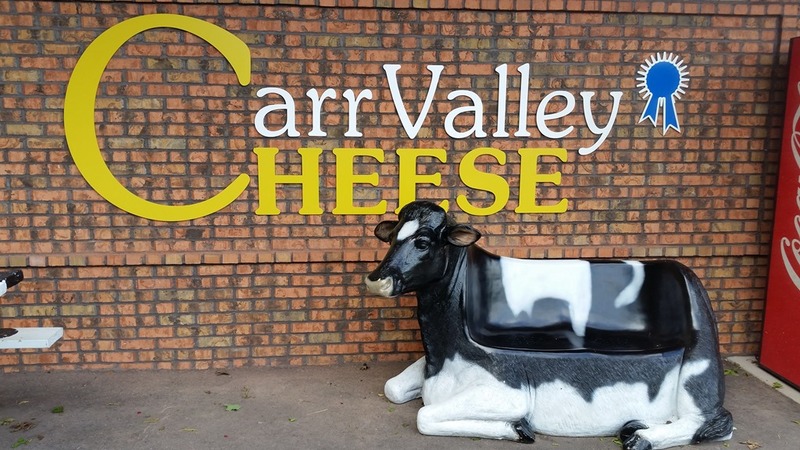 We continued on to Carr Valley Cheese. The cow is a seat! This was out in the country. 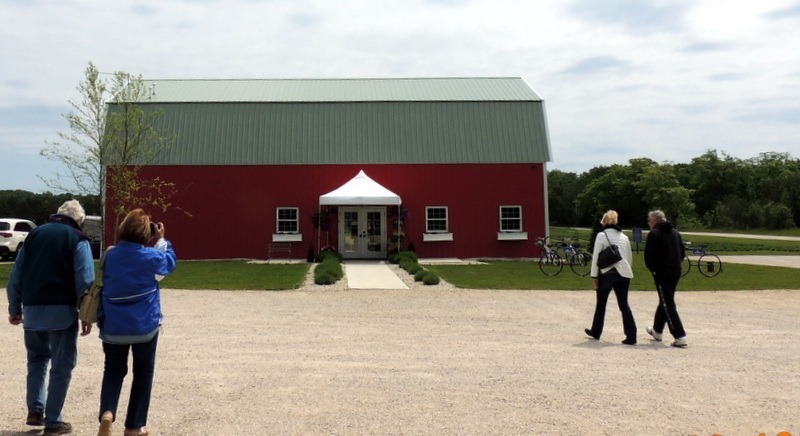 They produce winning cheese and is in the 4th generation of family cheese makers. The current owner is a Certified Cheese Maker, which means that he trained for 15 years to obtain his certification. They had finished their cheese production for the day when we arrived at 3 PM, so we missed the chance to tour the factory. They still produce cheese the original way that the family has been producing cheese since the great grandfather was the cheese maker. We sampled some cheese and watched their video. I really liked their 3 month old cheddar. The same cheese at 6 years old, was very sharp. We did not purchase any, as the packages were too big and we did not want that much cheese. We continued on back roads, passing these round barns. 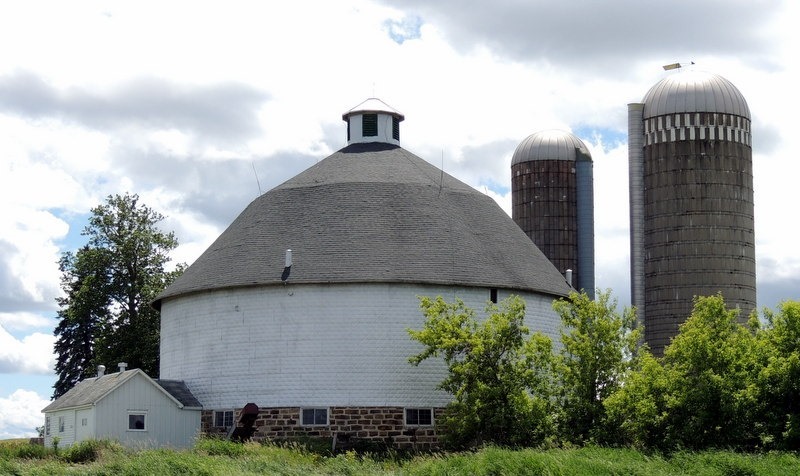 These were not on the list of Wisconsin round barns. 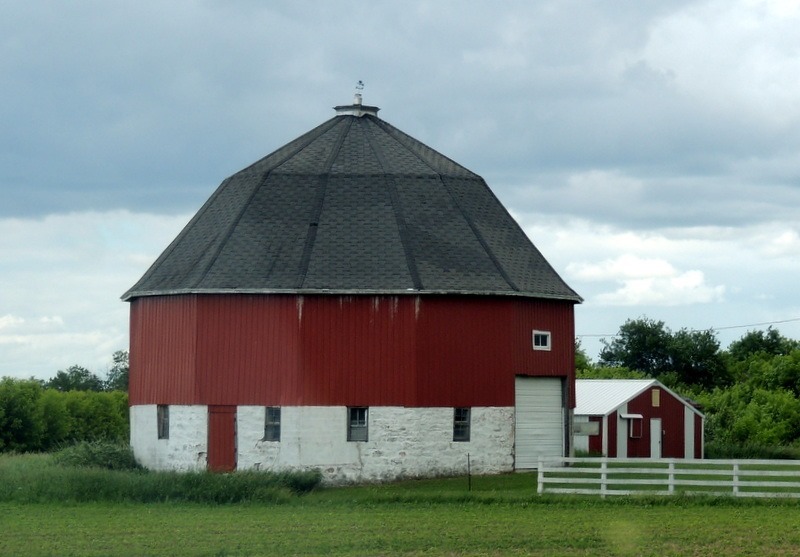 Most of the round barns are in the south of the state. Round barns hold up better in strong winds and of course, the devil cannot hide in the corners! Tuesday- Moving day. We left around 10 AM for the relatively short drive to Freemont WI. We are staying at a Jellystone RV Park, the first one we have ever stayed at. It is a nice place, but we would not usually stay at one. It is an Encore resort and we have a significant discount. The off the street price is $60 + $4 activity fee and tax, we paid $25, including the activity fee and tax . If you have kids this is a great place. It is large, with a nice pond and lots of geese( and lots of geese poop!). 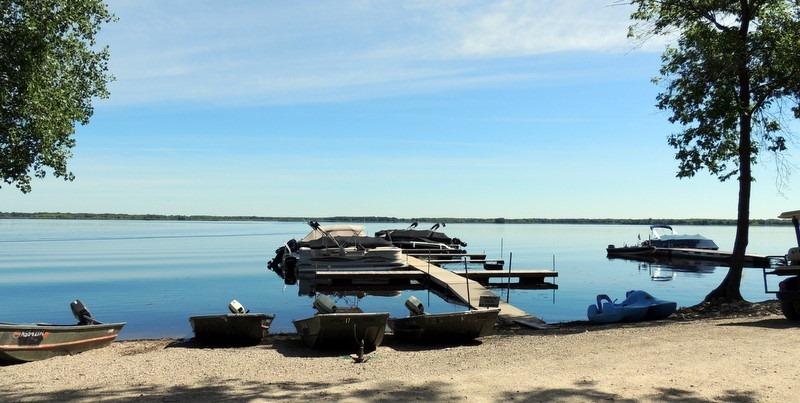 In the back, is a large lake for fishing and boating, below. There is also a water park with the Olympic size swimming pool, above. We arrived a little after 1, and set up. Then we went to the RV park laundry, which was a joke. There was only 1 washer and 1 dryer. So we left the park and went to the town of Freemont. We could not find a laundromat, so we stopped at the Town Hall to ask. It was right around the corner and there was no sign. We did 6 loads of laundry. We returned to the MH, ate dinner then went for a bike ride. Neither of us had a good time. Bob had difficulty due to his heart. For some reason, I suddenly developed a stomach ache. I had to stop and thought I was going to pass out. I was sweating profusely, became nauseated, vomited and had diarrhea. I was very lucky there was a decent porta-a- potty a few feet away. Bob rode back to the MH and got the car to come get me. I laid down for about an hour, then moved to the recliner. Bob returned and retrieved my bike, from half way across the park. We watched TV and went to bed. Wednesday- It is supposed to be warmer today. Yesterday was cloudy until about 4 PM, when the sun came out. The temp was in the 50’s most of the day. Today is supposed to be in the low 70’s with a possibility of severe thunderstorms in the afternoon. We are glad that we can get the local TV stations for the weather forecast. We also have a weather radio that blasts if there are severe thunderstorms in the area and the tornado shelter is the park bathrooms. We left and went to Appleton, north of Osh Kosh. We arrived in town and stopped at Petco for dog food. They only had the canned food, but it was on sale, so we bought some. Then we went to Petsmart and found the dry food. By this time it was lunch time, so we went to a brew pub for lunch. Bob had the Mac’n Cheese sandwich. He said it was okay, but not great., but he liked the beer. I had the prime rib wrap special, which was pretty good. We left and went to the Wells Fargo across the street to get quarters to do the laundry then to Costco for gas, $2.49/gal. From there, we went to the Appleton History Museum, $15 for the two of us. 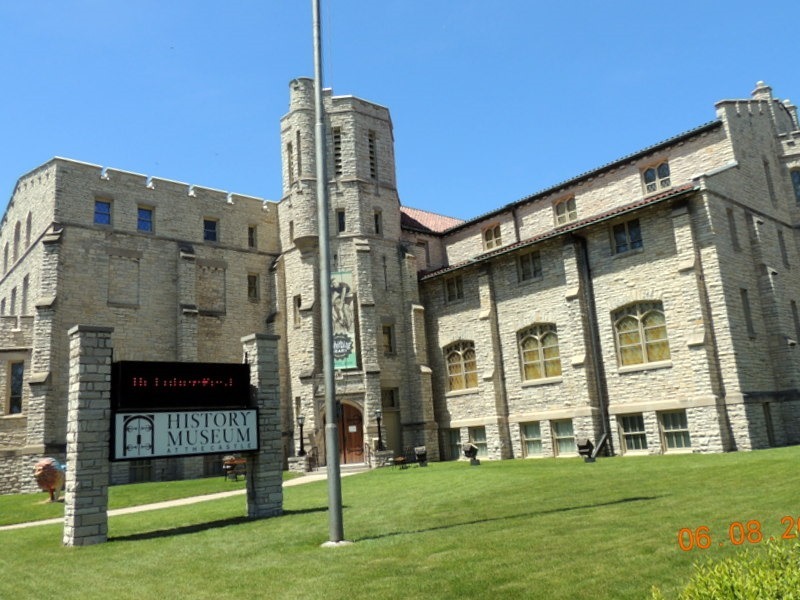 The museum is housed in a former Masonic Temple. It is called the Castle Museum. 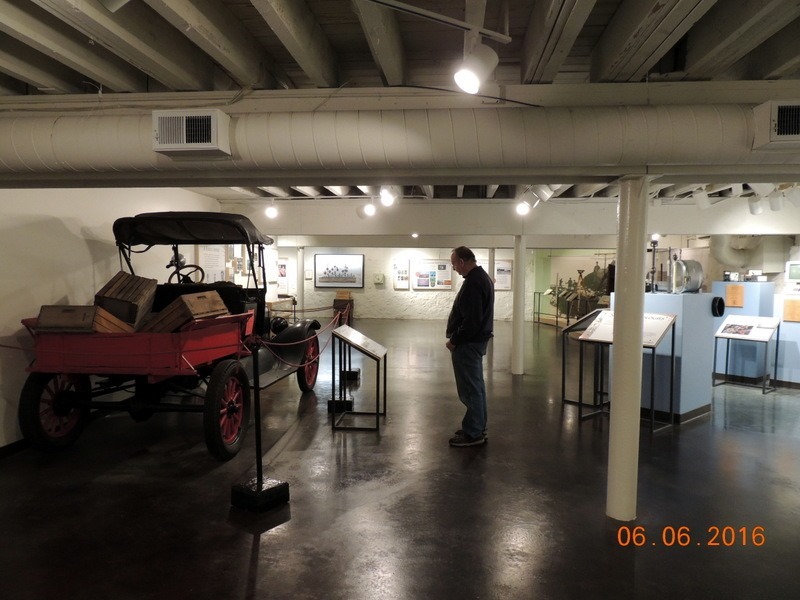 Below is the museum and the stained glass windows on the main floor, in a room with an African American exhibit on the history of African Americans in Appleton. 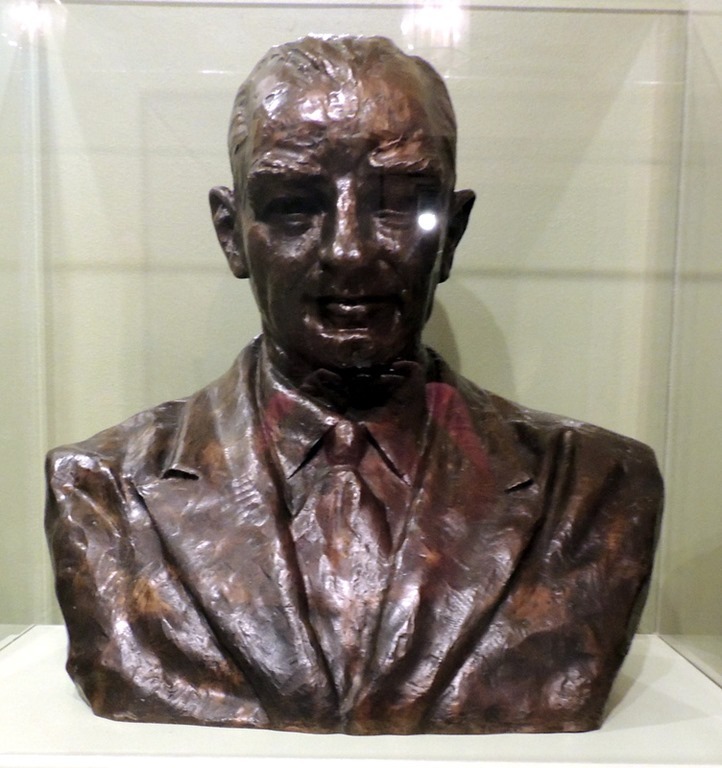 Appleton was the home of Harry Houdini and Senator Joseph McCarthy. They had exhibits on both. 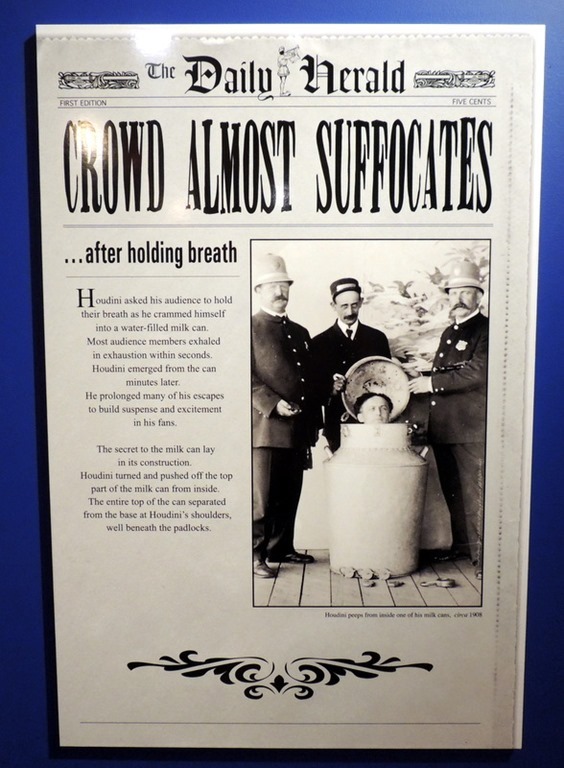 We started upstairs in the Houdini exhibit. 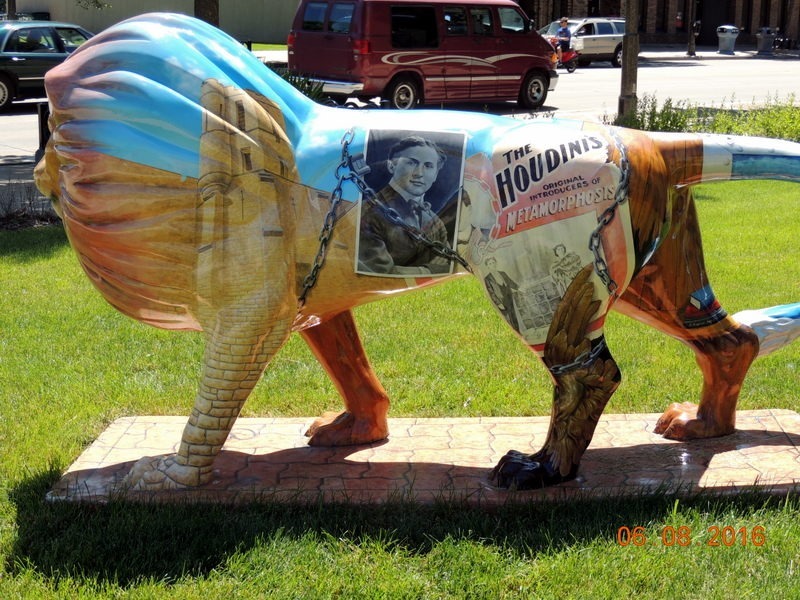 Houdini said that he was born in Appleton, but he was not. He was born in Budapest, and his family immigrated when he was a child. His father was a Rabi at the local Jewish Temple. He died young and Harry had to help support his family. 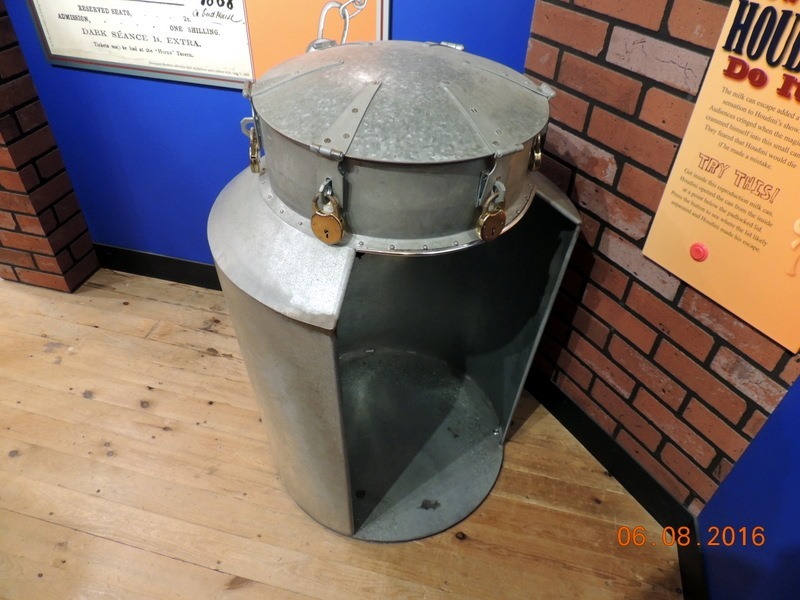 Here are some of the exhibits. Below is a replica of the the coffin that he was buried in. He had great stomach muscles and had challenged a college student to hit him in the stomach. The kid hit him before he was able to tighten his stomach muscles. He ended up in the hospital. He died of a ruptured appendix, but they think he was going to die anyway from the appendix and the kid was not charged with anything. 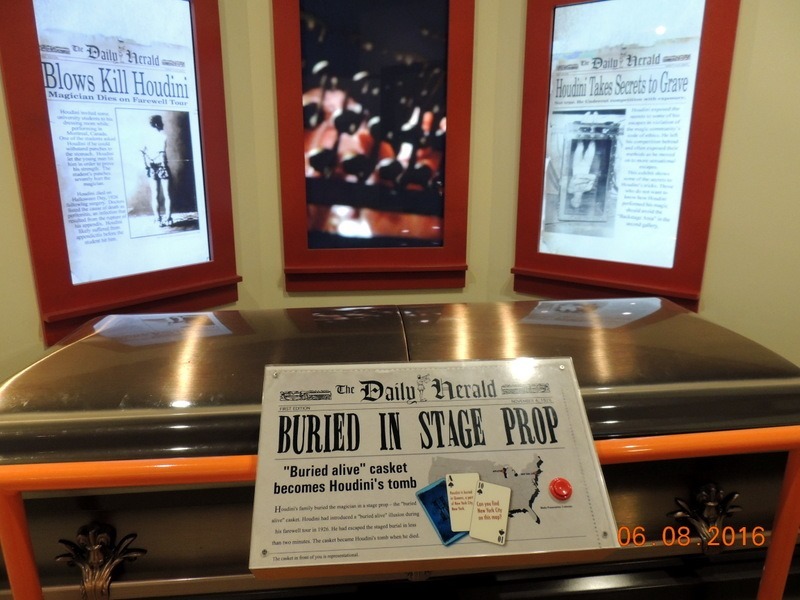 His family buried him in his stage prop coffin, in Yonkers NY. Above is the milk can from the trick he did. It was really small! The top raises up and he was able to undo the locks from inside. That also gave him air. 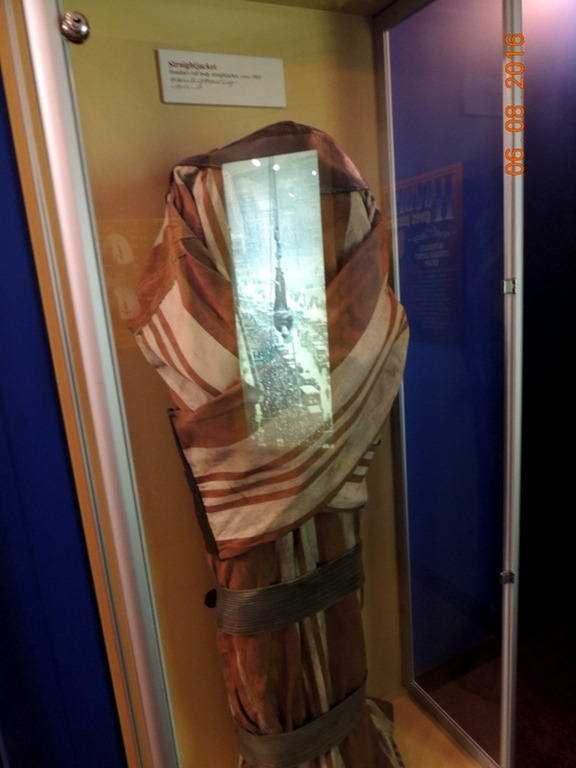 Above is the famous straight jacket. 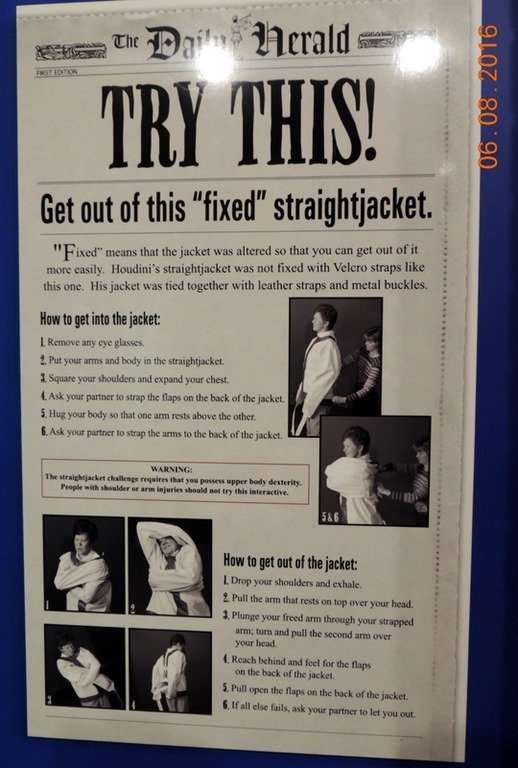 they had one there in a box and you could try it on and get out of it following these directions. There were more magic trick exhibits. 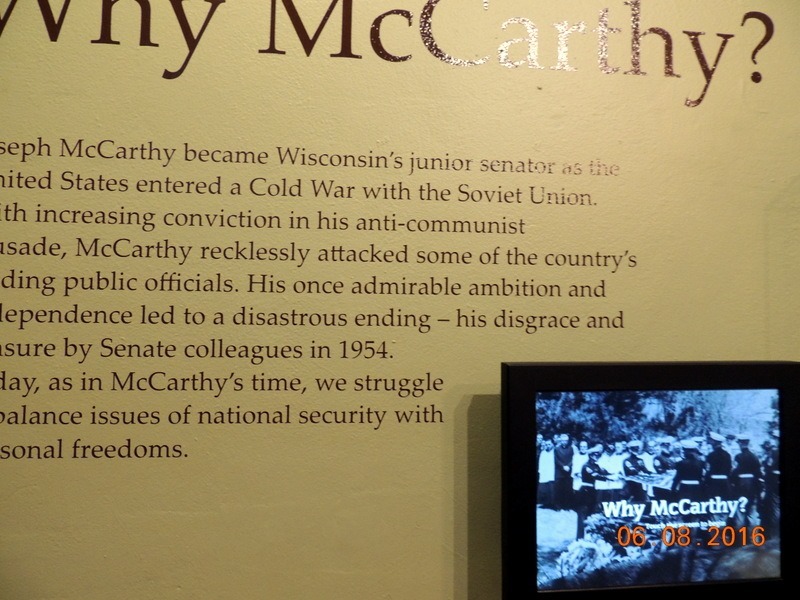 We went to the basement to the McCarthy exhibit. It was only two items. The sign had, in the right bottom corner 4 different videos, each lasting only a couple of minutes. They told the story of him being a Judge in WI, and known for his understanding of the law and leniency for people and the fairness of his verdicts and punishments. He also would travel around the state, presiding over trials. He was a war veteran from WWII, then elected and of course we know what happened. Congress finally saw through him, and took away his power. He then drank himself to death. He had a pretty big funeral in Appleton, and is buried there. We did not bother going to the grave. Both my parents were federal government workers in the 1950’s and needless to say, they were not fond of McCarthy. It was a very difficult time to work for the government in those days! We walked back up the steps to the main level and went to the History of Bicycling in Appleton. 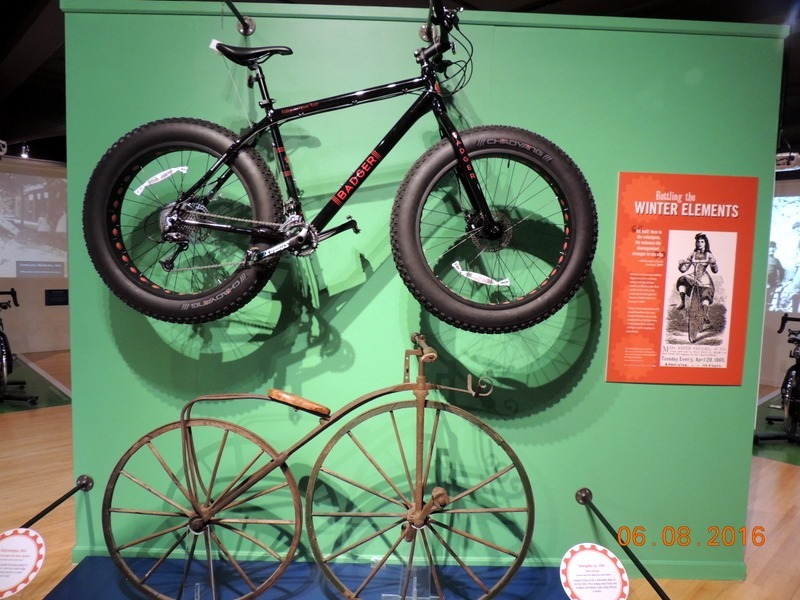 WI is known for biking, and there was a long history of biking in the community. We have been to several ‘bike museums’ so we moved through rapidly. 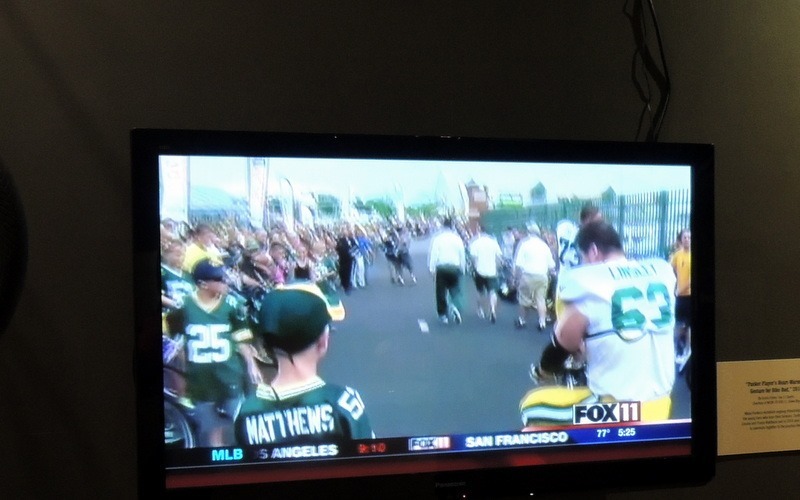 What I found very interesting is that the Green Bay Packers, borrow bikes from kids at Lambough Field and ride them across the parking lot to the stadium. They showed a video, about this and if you look at the screen closely, you can see one of the kids and one of the players riding the kids bike. He was too big for the bike, but he rode it anyway. In the video, they interviewed some of the players and the kids. It is cute, and they still do this today! Below, the lion was outside the museum. We returned to Fremont. I ran over to the laundry in the RV Park and washed another load of laundry. We settled in, watched TV and went to bed. Thursday- Moving day! We packed up and left around 11 AM. 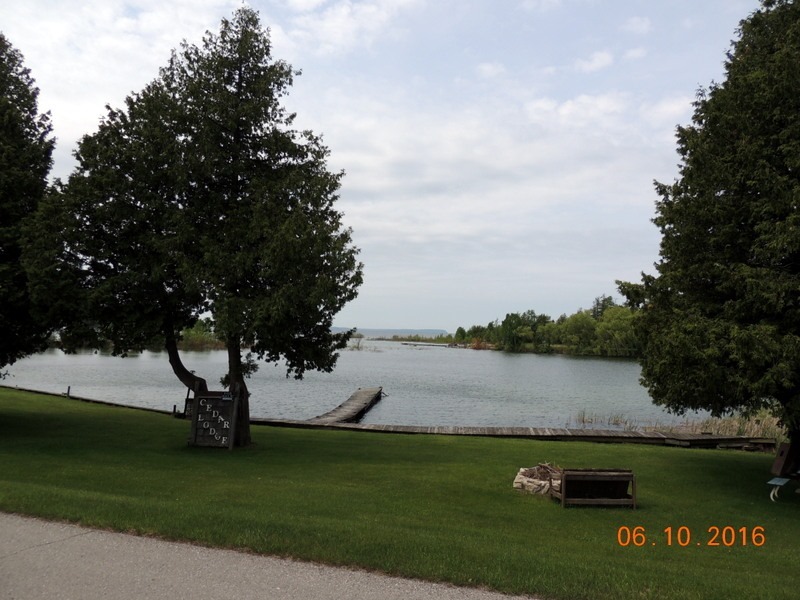 We had a short drive to Door County, and Tranquil Timbers, an Encore park in Sturgeon Bay WI. 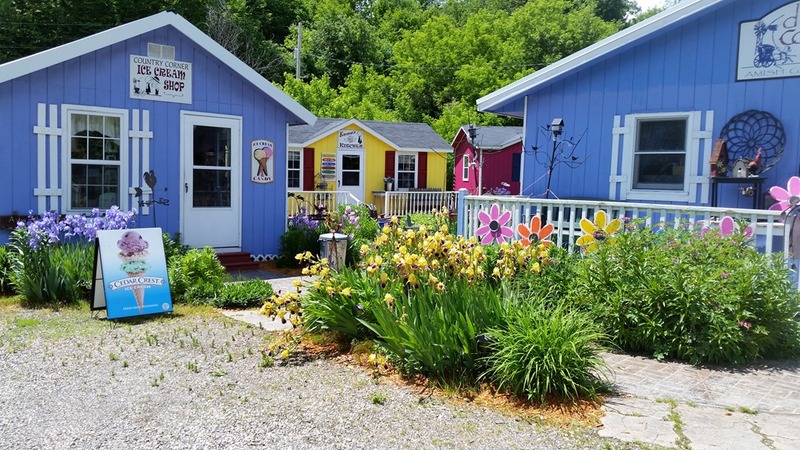 Door County is known for its beauty. We had an easy drive around Green Bay, or we would have, if they had not changed the exit numbers. The GPS took us to the wrong exit and we had to back track to get to the right exit, through the road construction. We arrived at Tranquil Timbers and the gal gave us a choice of two sites. The site that we were assigned was 30 amp, W/E or a FHU 50 amp, at no extra charge $25. The reason I put in the cost is because WI is very expensive. If we did not have these discounts, we would be paying between $45 and $60 per night! We went to look at both sites. The 30 amp was in a field, and we would be able to get satellite, but there was a tree, and we did not think we would fit in the site, as we are 13 ft. tall. We chose the 50 amp, FHU, but we cannot get satellite, as it is located in the trees. It is a nice large site. That is okay, there is not much on TV right now anyway. We can get local TV on the new antenna, but only in the bedroom, and only ABC. At least we can get local weather, and they are predicting severe thunderstorms for the evening. We settled in and sat out in our recliners, reading and enjoying the beautiful weather. It was high 70’s, dry, with bright blue skies and low humidity. We had thunderstorms in the late evening, but the severe storms went to the south of us. The lady next door, came over to talk to us. Her name was Barbara, and she and her husband Jim, have been full-timers for 18 years. She was very nice, but had definite memory issues going on! Friday- We were up early and left to drive about 40 miles to the north. We had chosen today to take the ferry from Gills Rock to Washington Island. There was more road construction and we ended up running later than expected. We really drove as fast as we could and arrived just in time to catch the ferry, called the Island Clipper. There are two ferry’s, one that takes cars and this one that takes only passengers and bikes. The Clipper is owned and run by Captain Charles Voight. and holds 149 passengers. We crossed Green Bay in a little less than 30 minutes. The ferry runs every hour, back and forth, so it is a quick journey. Below are the bluffs as we were leaving Gills Rock. In the distance, we could see the Plum Island Lighthouse, Plum Island WI, overlooking Lake Michigan. This lighthouse was built in 1896 in response to mariners’ complaints that Pilot Island was situated too far east. Plum Island marks safe passage in the treacherous waters between the tip of the Door Peninsula and Washington Island. Below, Plum Island became a lifesaving station in 1895. In 1915 the US Life-Saving and Revenue Cutter Services merges to form the US Coast Guard. The area that we were traveling through is called “Death’s Door” due to the high number of shipwreck’s in this area. 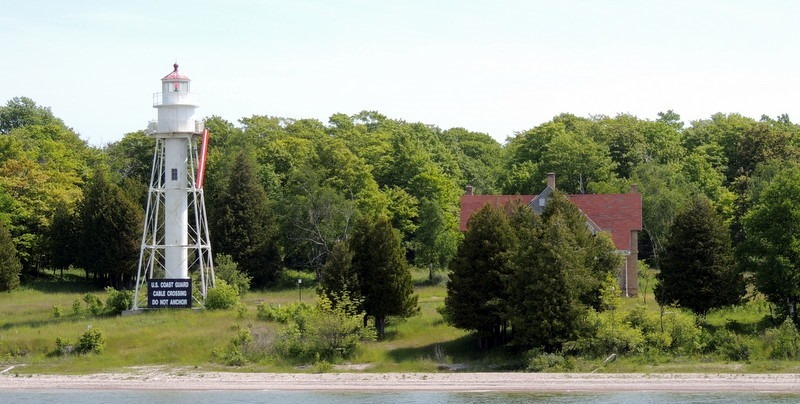 This is the Pilot Island Lighthouse and the fog horn building. 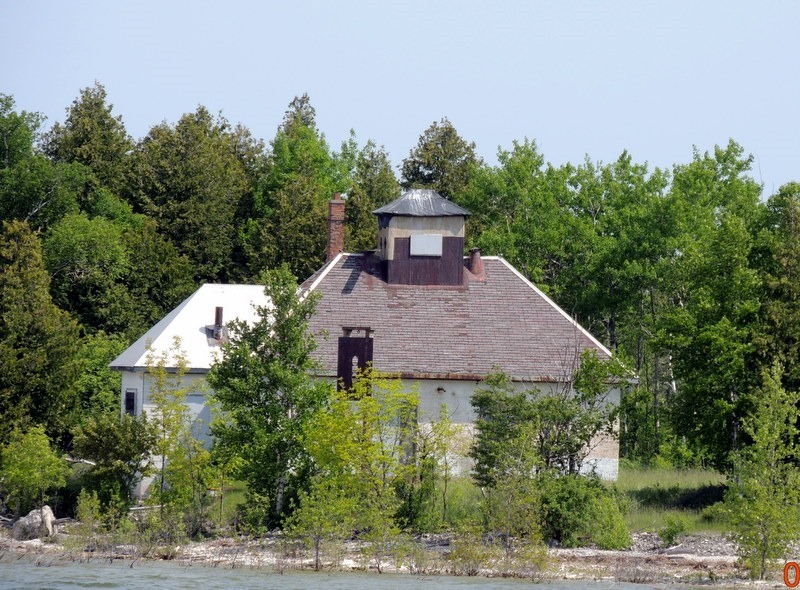 Built in 1858. this lighthouse is said to have witnessed the most shipwrecks of any light on the Great Lakes. Built of Cream City brick, it is in need of repair. 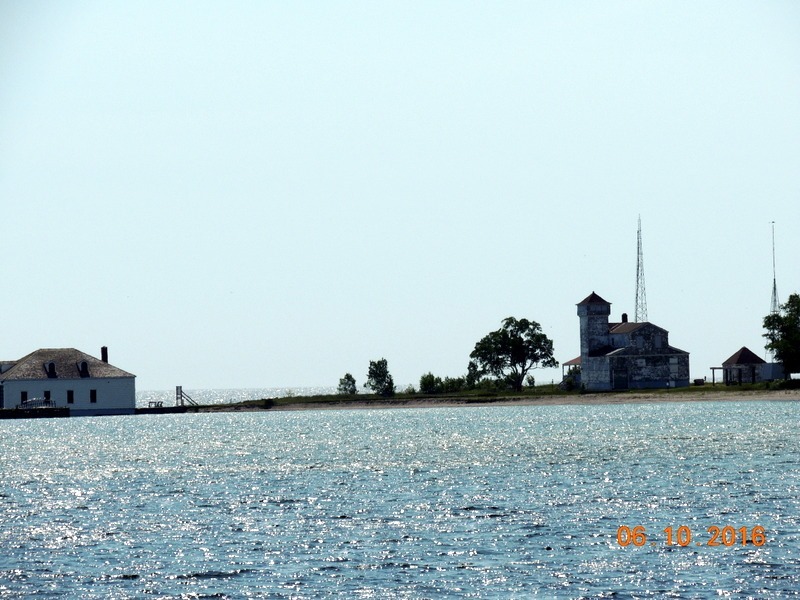 There is a third lighthouse in the area, on Rock Island, but we were not able to see that lighthouse.It is northeast of Washington Island and we are in the southwest.. Above on the left ate the two car ferries in Death’s Door, and on the right is the Plum Island Coast Guard station. Capt. Charlie also owns the Viking Train, and we had purchased a dual ticket, $25 each. We got off the ferry and onto the trolley/train, for the 2 hour tour. Right after we boarded the trolley, we saw this house. 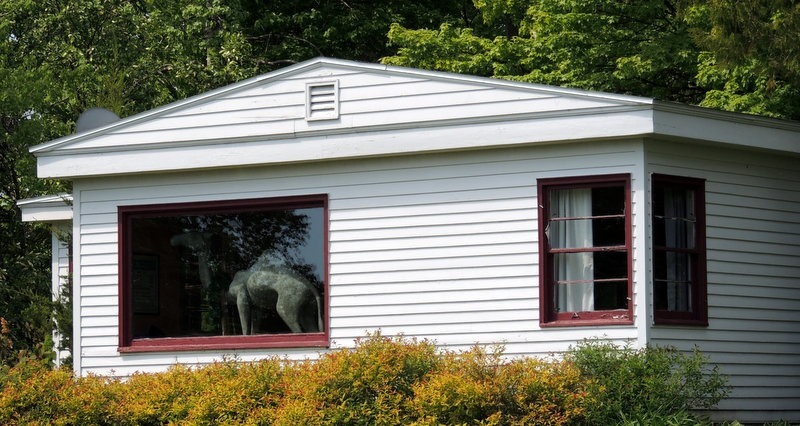 If you look closely, in the window is a camel. It appeared to be stuffed! The guide, Judy, slowed down the trolley for us to take pictures of West Bay. This is facing the mainland, and we can see the bluffs of Ellison Bay in the distance. The brochure states that it stops at 4 areas of interest, what they did not say, was that it also stops at two places for you to shop! 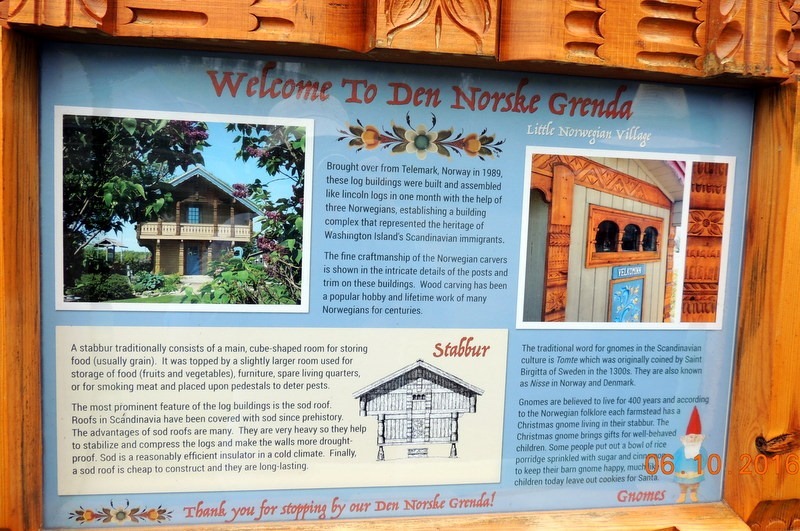 Our first stop was at Den Norske Grenda, a Norwegian village, with a shop, Mann’s Grocery Store and Ace Hardware, where you could use the facilities and buy lots of junk and fudge. The fudge is made on the island, and people said it was very good. We did not purchase any. It was on the edge of their downtown area. 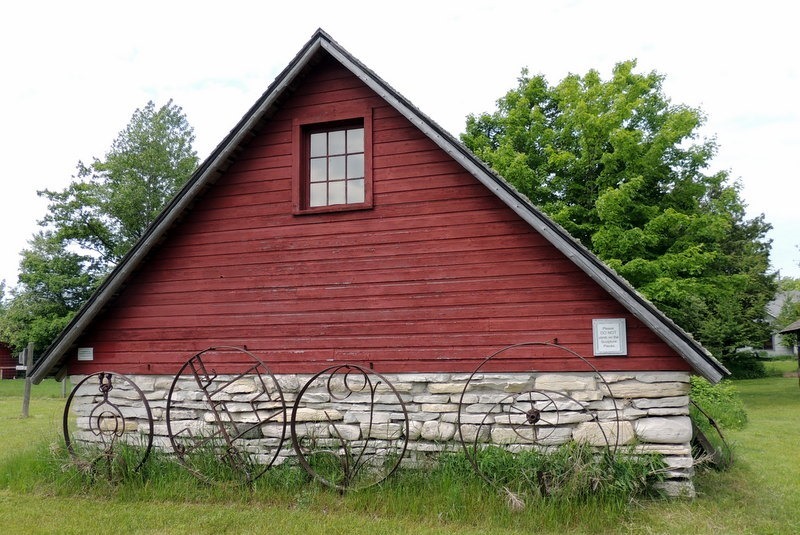 The Norwegian Cottage shown above was brought over from Telemark, Norway, and assembled on this spot. In Norway, the bottom is used for grain and the top for housing. In this case, it is a toy store, which was not open today, Note the grass roof. The weight of the grass/dirt, adds weight to keep the building together. The train moved on to the Stavekirke. 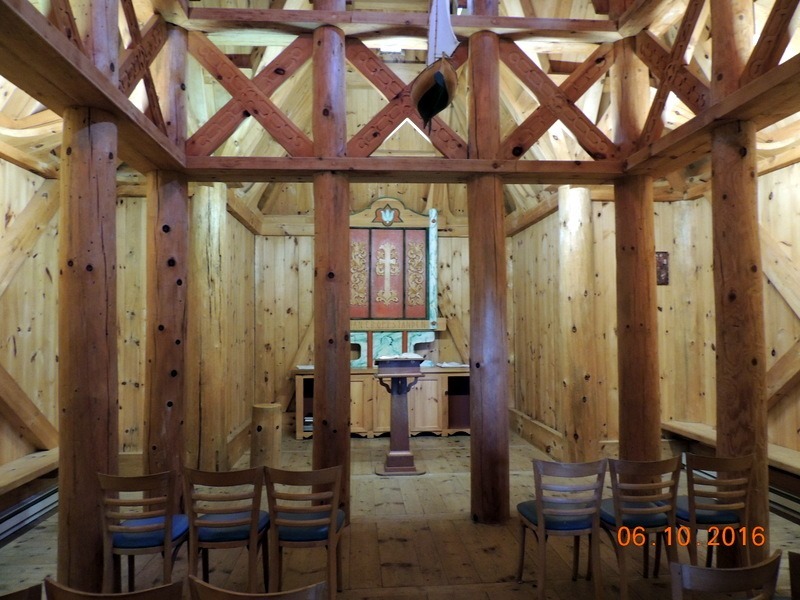 A Stavekirke is a place for spiritual meditation and worship. It is a Christian house of worship, dedicated in August 1995. 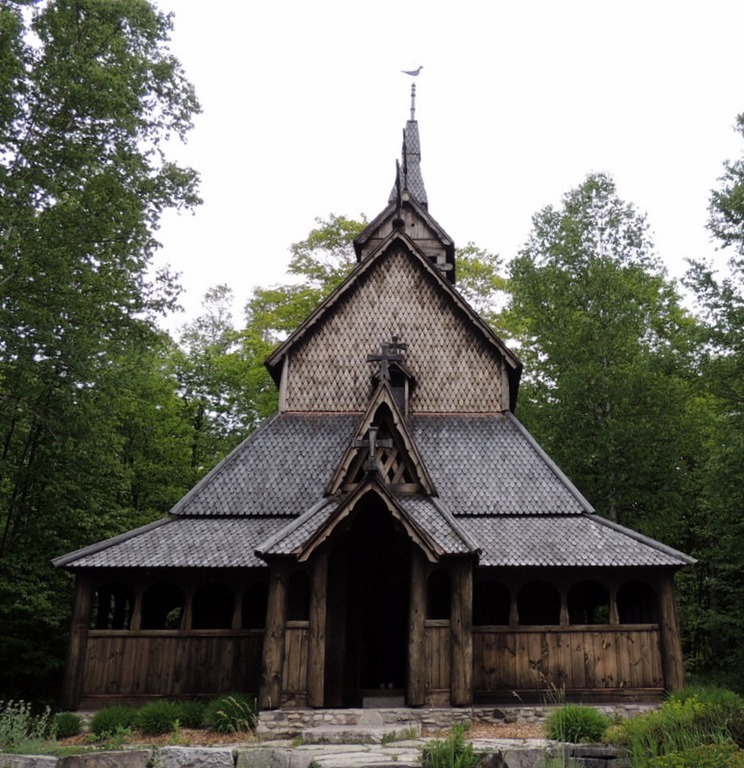 The Stavekirke is patterned from an ancient style of church construction found in Norway during the medieval times. 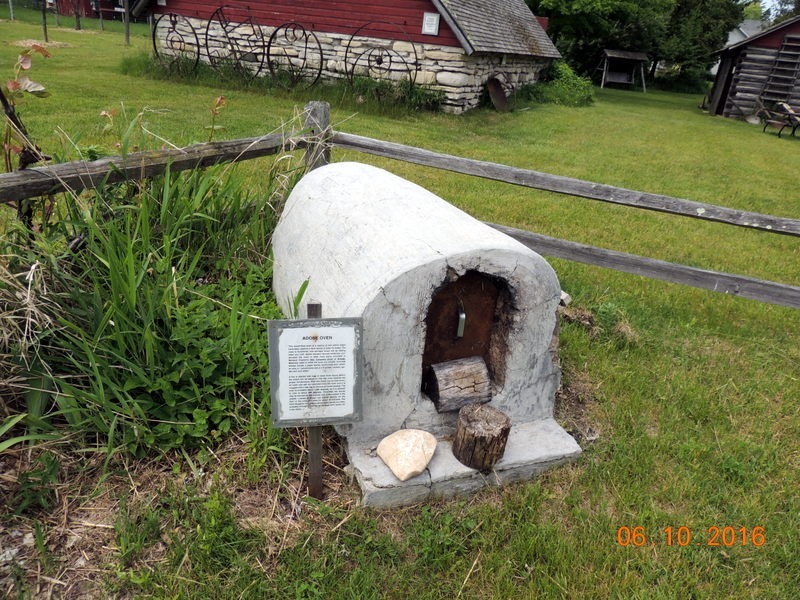 It is a replica, made from local supplies, and a tribute to the large Scandinavian heritage of the people of Washington Island. There are two Stavekirke’s in WI, the other is in Madison, and we missed it when we were there. Stave means ‘poles’ in Norwegian, as shown in the picture below. There are 12 center staves if masts as well as heavy beamed, ship-like construction through out the structure. It uses Viking shipbuilding techniques. This Stavekirk is patterned after the Borgun, Norway church built in 1150 AD. Only 33 of these churches remain in the world. Across the road from the Stavekirke was the local Lutheran Church, which also has a Catholic Mass on Sunday afternoon’s. We left there and went around the corner to the Lavender shop. Were they had all things Lavender! Below, the shop and the lavender field behind. 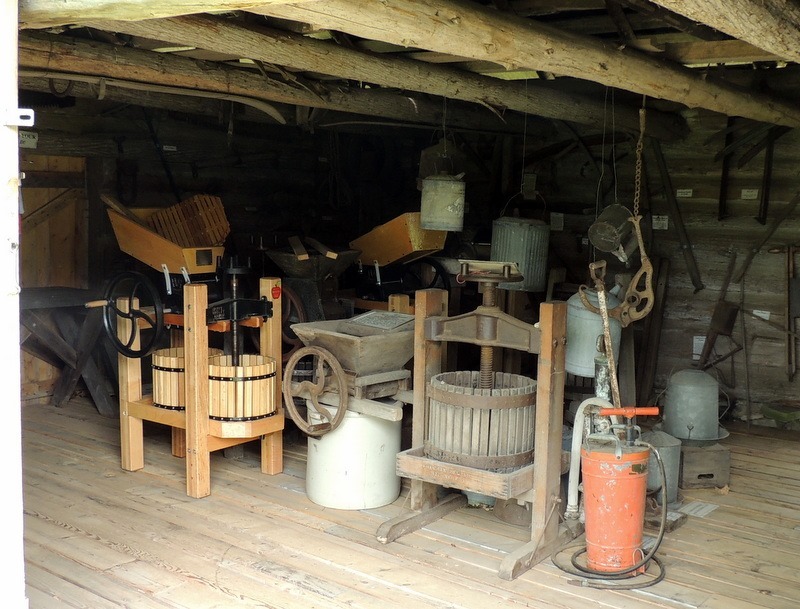 Our next stop was the Farm Museum. Again, something we have seen many times! 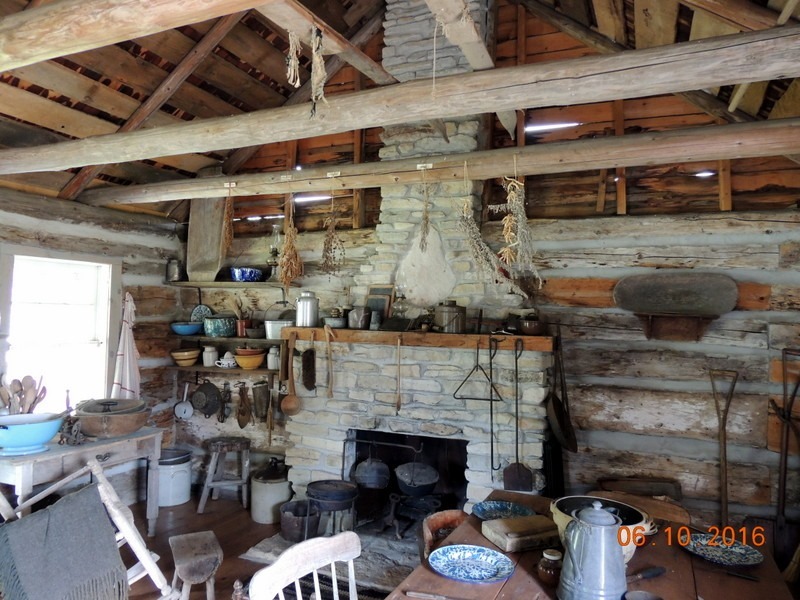 Above on the right was an oven, out doors, and away from the house, so that it would not burn down the house. 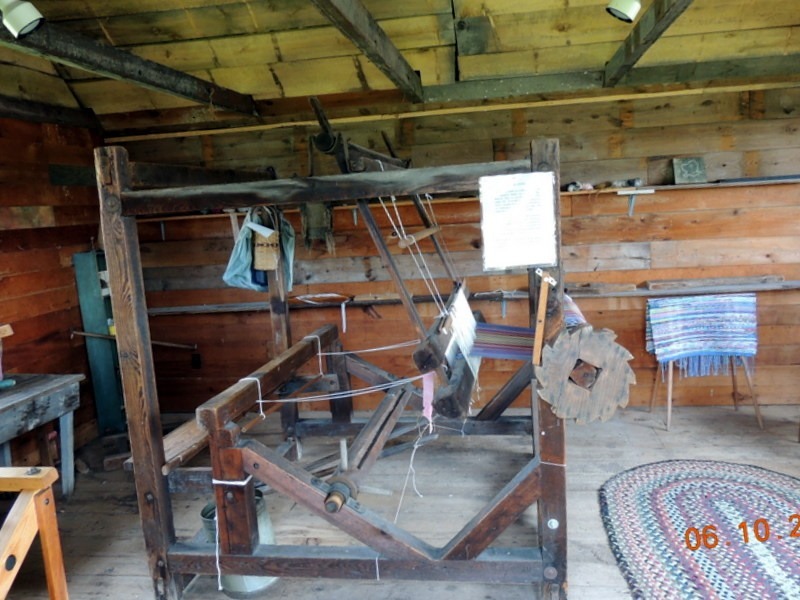 Of most interest to me was this large loom. The user sits in the middle and weaves. They do weaving demonstrations, but no one was there today. 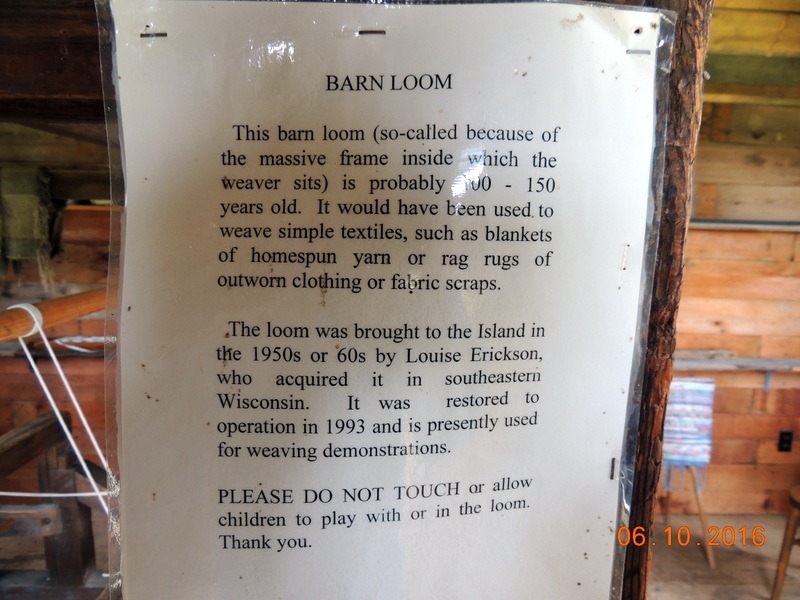 They ask that you not touch it and this loom is between 100 and 150 years old. As we were boarding back into the trolley, this old care went by and the driver honked the horn at us. Ahooogah! Our next stop was School house beach. 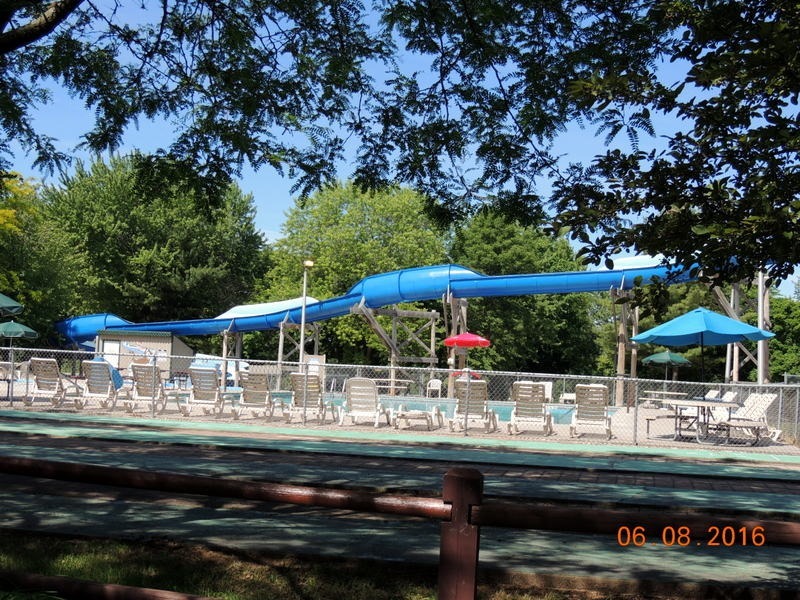 It is located on Washington Harbor and the average depth of about 100’, is the most popular swimming site on the island. There is a shipwreck in the harbor and there is a lot of diving goes on in the area. This is one of 5 beaches like this in the world. the other four are in Sweden, Norway, Nice France, and Mexico. 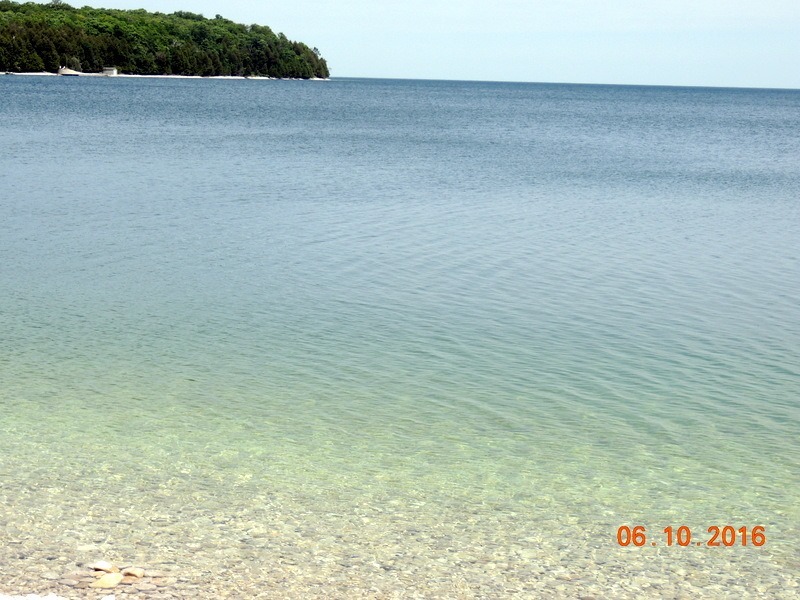 The beach is made up of beautiful white, sooth, stones, great for skipping on the crystal clear waters. The bluffs above, are part of the bluffs that go all the way to Niagara Falls, and are part of the falls. 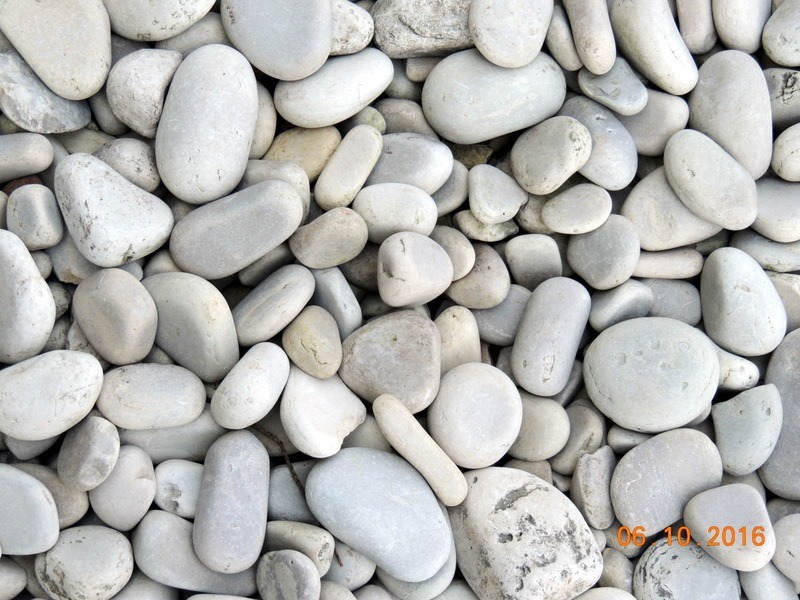 For years, people would take the rocks, putting them in pockets or purses. The rocks were disappearing at such an alarming rate, that they stopped people from stealing the rocks and there is a $250 fine for taking one of them! We returned to the trolley and went back to the boat. Capt. Charlie delivered us safe and sound, back to Gills Rock. We drove couth to Ellison Bay and stopped at The Viking Restaurant for lunch. I had a taco salad and Bob had the special, fish taco’s. 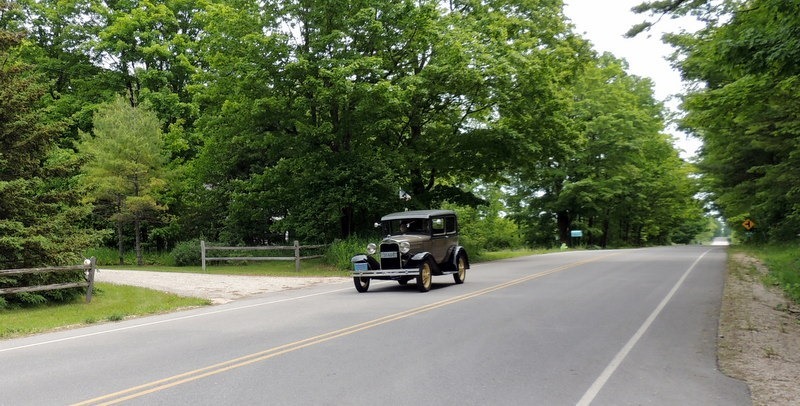 We continued south, stopping at a Wayside that we had seen on the drive up. We had seen a sign saying geological marker. We were standing halfway between the equator and the north pole. 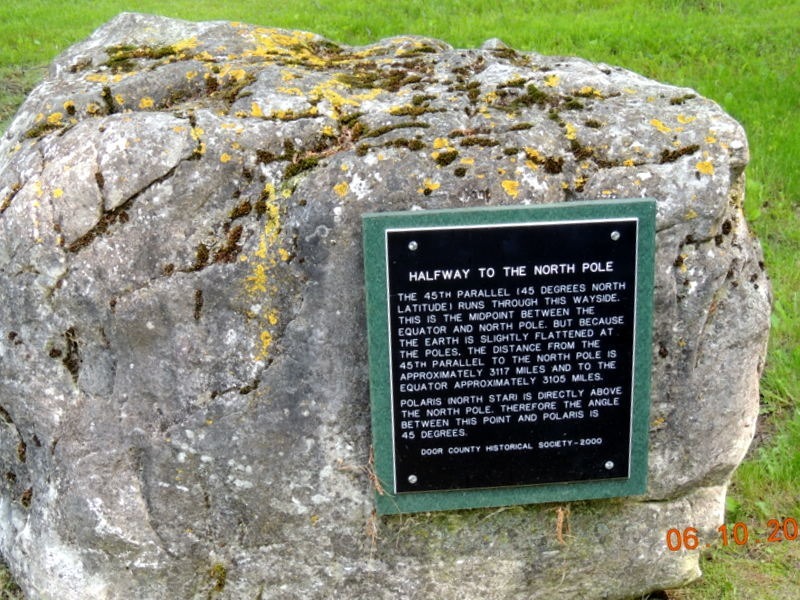 We have been a lot closer to the North Pole, when we did our cruise in 1995. We returned to the MH and had a quiet evening, both of us falling asleep in the recliners.